Prairie flameleaf sumac flamed out with respect to fall foliage this year. 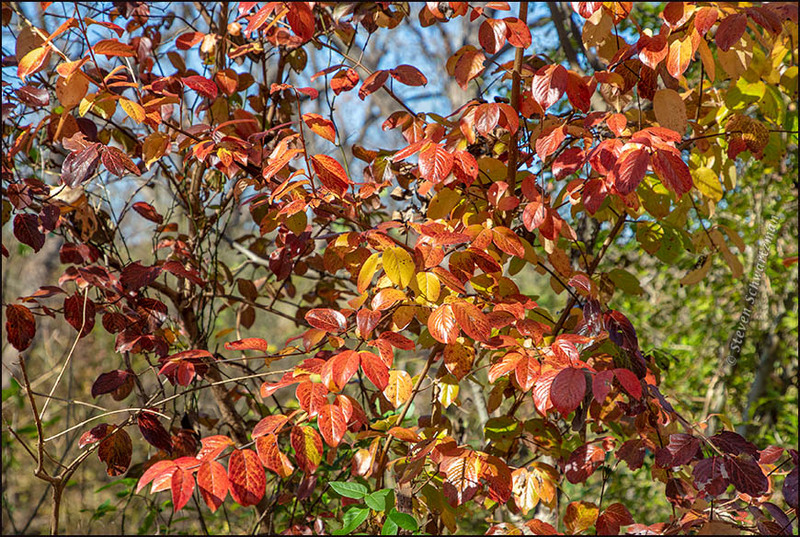 2018 wasn’t a good year for colorful fall foliage from prairie flameleaf sumac (Rhus lanceolata), of which I’ve shown you many good examples in other years (for example in 2012 and in 2015). However, I did find a few small instances of bright leaves from that species this year. 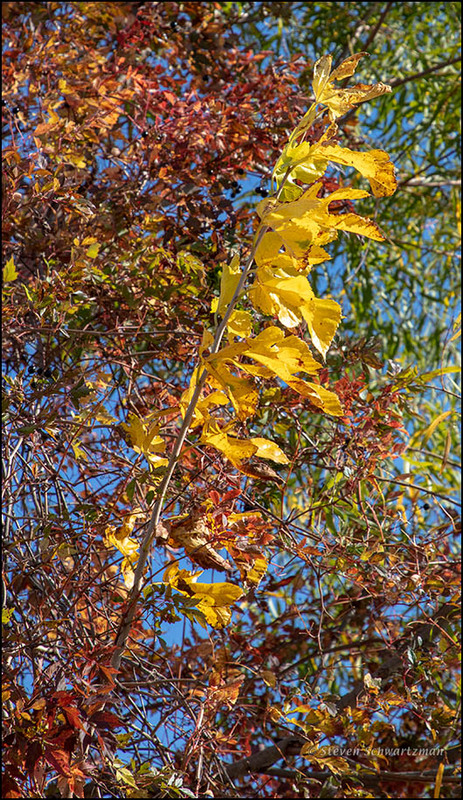 The one that you see in the first photograph came my way on November 26th as I drove down (literally) Ladera Norte and quickly pulled over to record the bright color I’d glimpsed in the leaflets of a sapling. Even at so young an age it knew how to turn colors. I’d found the other example of flaming flameleaf sumac much earlier, before you’d normally expect it, along a path on the southwestern edge of my Great Hills neighborhood. 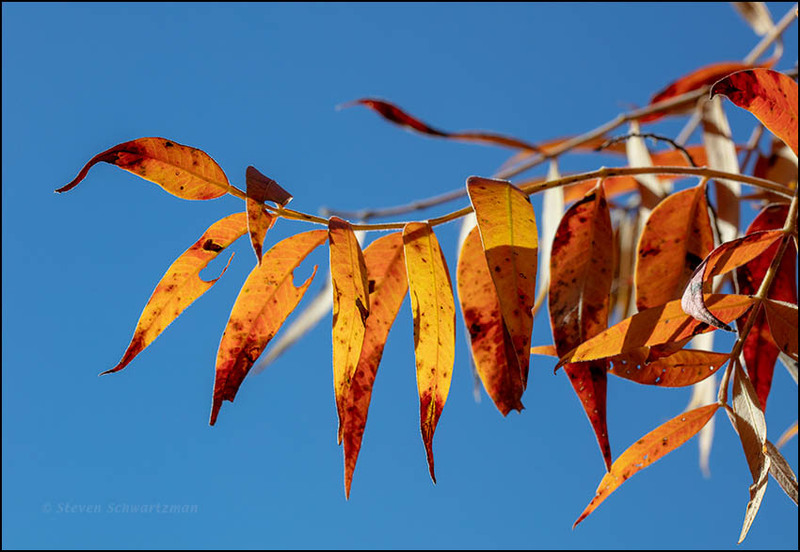 The date was October 4th, and a small portion of a full-grown tree had unexplainedly turned colors while all the other leaves were still green. Scrunching myself in behind the bright leaflets, I aimed outward to take advantage of the backlighting sun, grateful for how early these warm colors had begun. 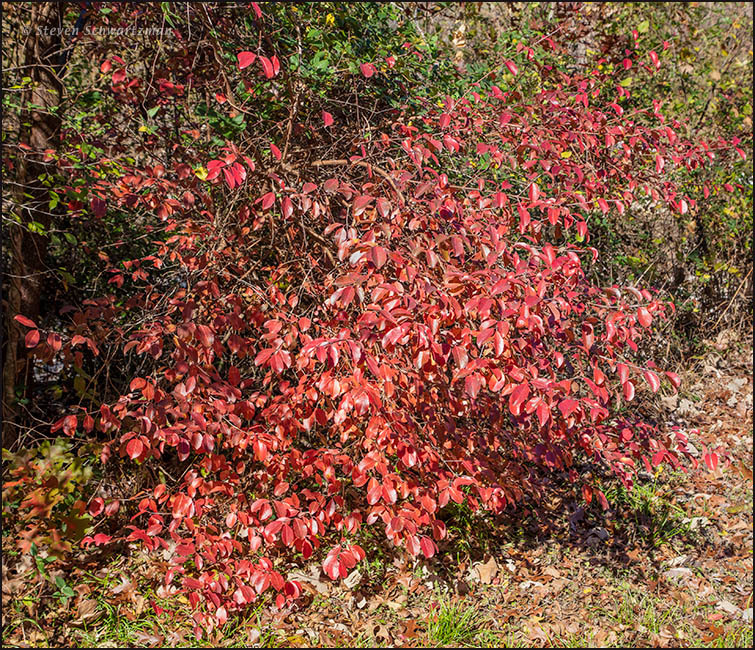 A smallish native tree that provides welcome autumnal colors here is rusty blackhaw, Viburnum rufidulum. In looking at that linked site, I noticed this species assigned to a botanical family I’d never heard of, the moschatel family, Adoxaceae, rather than to the honeysuckle family, Caprifoliaceae, into which botanists had traditionally placed Viburnum. That change sent me searching, and I found the reasons for the reclassification. I photographed these rusty blackhaws along the Brushy Creek Trail East in Round Rock on December 2nd. On December 1st we inaugurated not only a new month but a new place in nature, the Brushy Creek Trail East in Round Rock. Based on what another walker told me, the first stretch of the trail running east from A.W. Grimes Blvd. has been open only a couple of years. I’ve been extensively photographing nature in my little part of the world for two decades, so I was happy to be taking pictures in a new location. 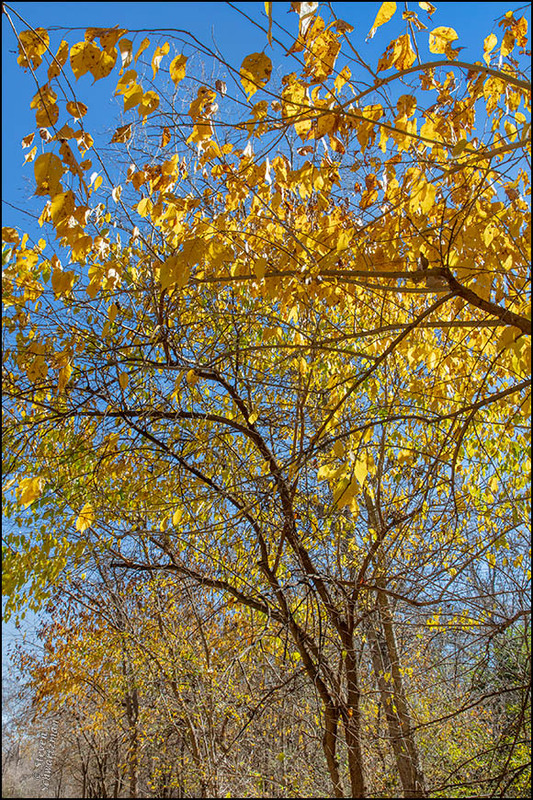 Probably the most striking fall find along the trail that day was some osage orange trees whose leaves had turned yellow. The fallen leaf shown below had even gotten impaled on a thorn from one of the trees, something you don’t see every day. (Look for the slender northeast-to-southwest shadow and you’ll be able to pick out the thorn. *) I assume the breeze that stayed with us during our walk had earlier done the impaling. 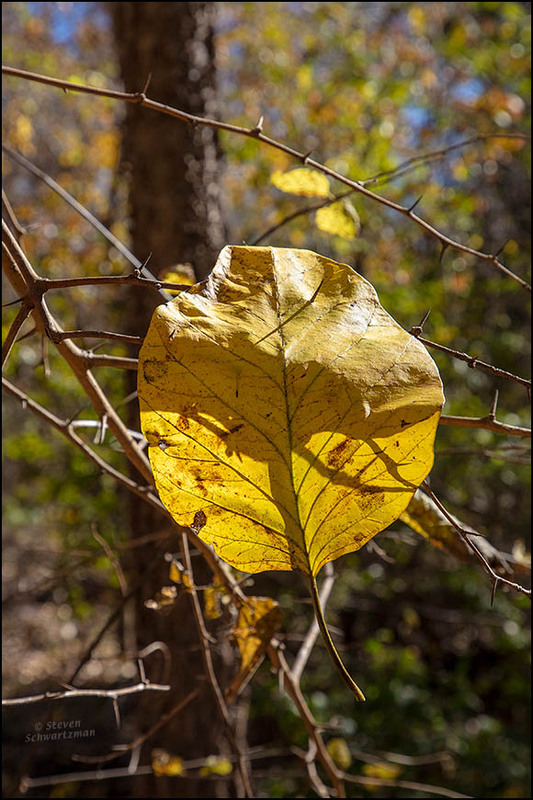 Maclura pomifera, as botanists call this species of tree in the mulberry family, has been known popularly not only as osage orange but also as bois d’arc, bodark, hedge apple, horse apple, monkey ball, bow-wood, yellow-wood, and mock orange. That’s a lot of names for one tree. * Just be careful that if you pick out the thorn you don’t dislodge the leaf. Another source of colorful fall foliage down here is the Texas red oak tree (Quercus buckleyi). 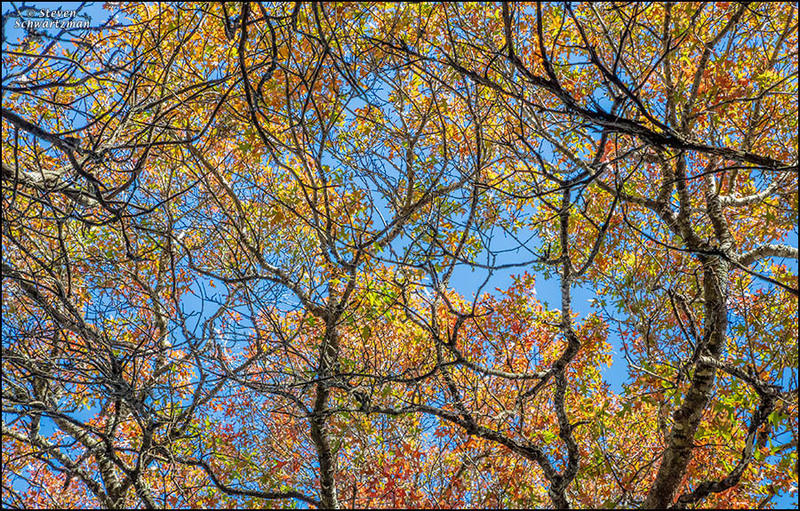 Well into the afternoon on November 26th at northwest-central Austin’s little-known Stillhouse Hollow Nature Preserve I aimed upward to record the colors in the leaves of one of those oaks contrasted with the blue of the sky. The network that the many darker branches created appealed to me as well. 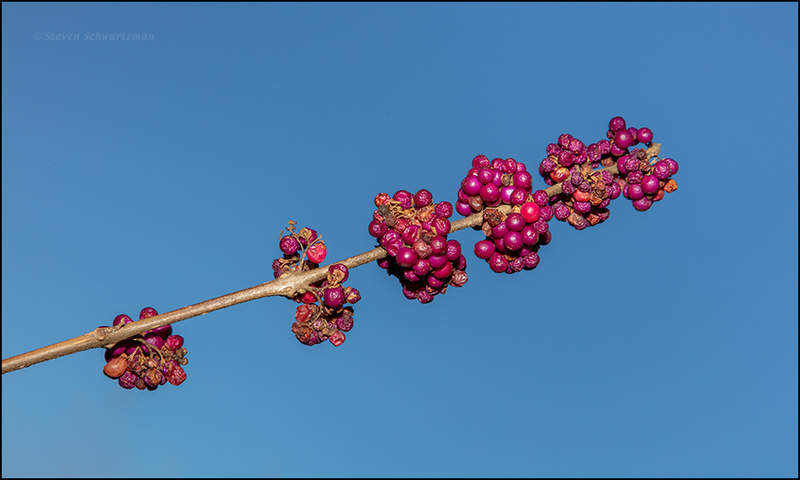 While at the preserve I also recorded the shades of magenta in six clusters of American beautyberry fruits (Callicarpa americana) that were in varied stages of drying out. 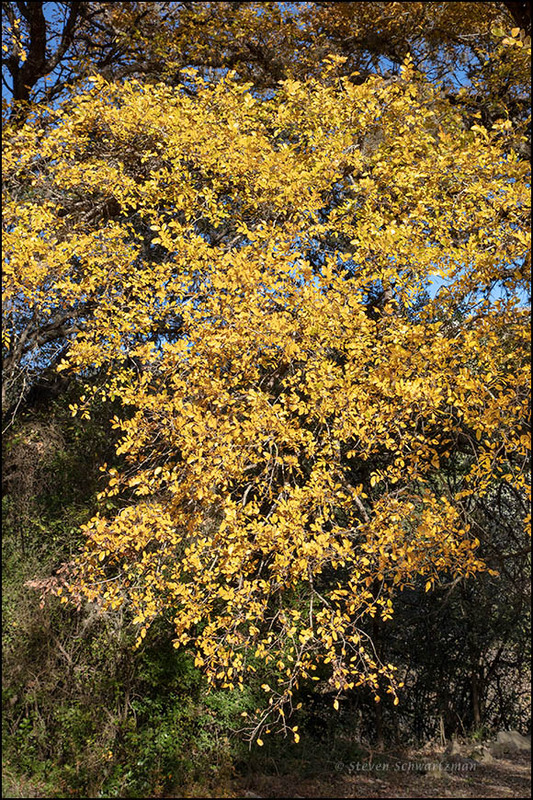 Cedar elms (Ulmus crassifolia) produce the most widespread autumnal yellow among native trees in central Texas. 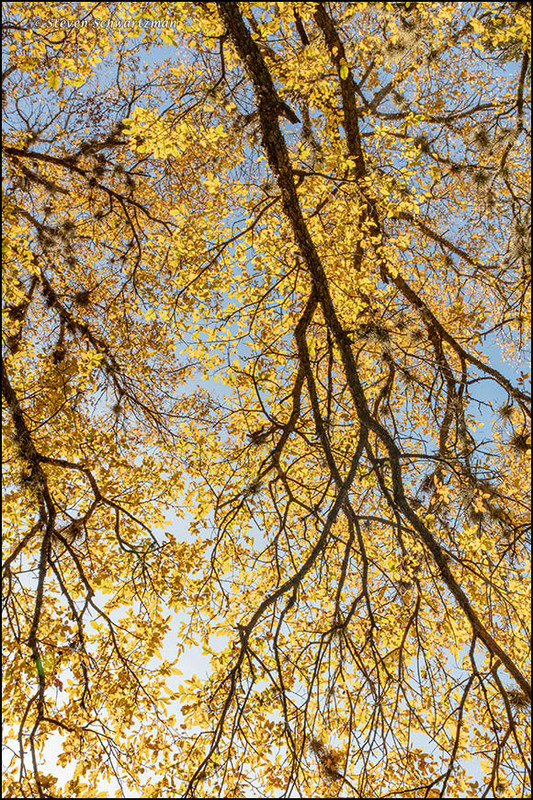 Each leaf is small, but a mature tree has a whole lot of them, and in the aggregate the effect can be quite pleasing, as shown above in a picture from Bull Creek District Park on November 26th. Below, from the same outing, you see what I saw as I stood beneath a large cedar elm and aimed a wide-angle lens up and out toward the late-afternoon sun. Notice the many ball mosses (Tillandsia recurvata) at home in the tree. 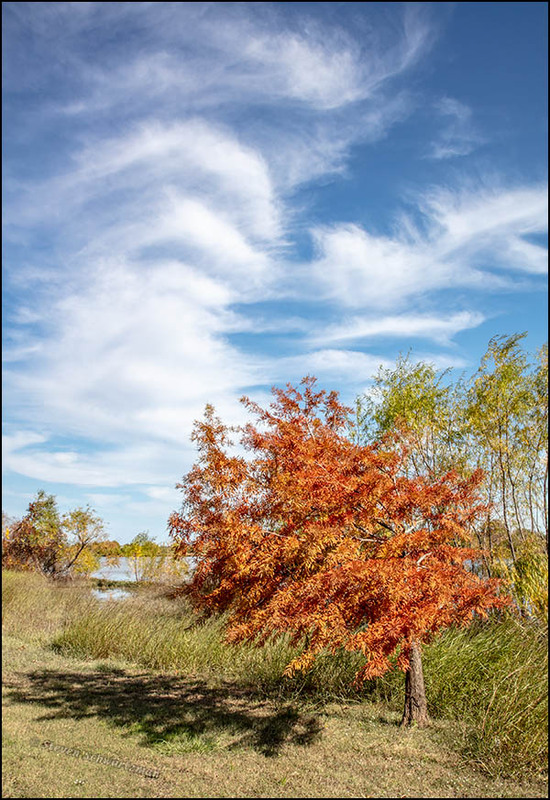 Compared to places much further north, central Texas is too warm for a lot of colorful fall foliage. Still, we do get some, and its predominant color is yellow. That’s true for the escarpment black cherry tree, Prunus serotina var. eximia. 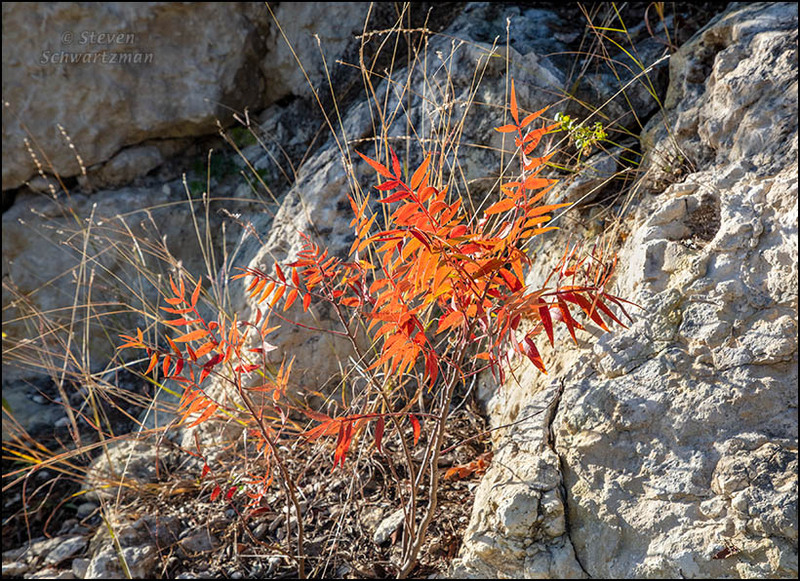 We found this specimen at the Doeskin Ranch in Burnet County when we drove out there on November 24th hoping to find some bright autumn leaves. We weren’t disappointed. I try to go to Meadow Lake Park in Round Rock at least once a year because I always find some good native plants to take pictures of there. On the afternoon of November 4th I visited the park and photographed this colorful bald cypress tree, Taxodium distichum, set off by fleecy clouds. (From a month-ago post you may remember an earlier stage in color change.) The trees beyond the bald cypress are black willows, Salix nigra. 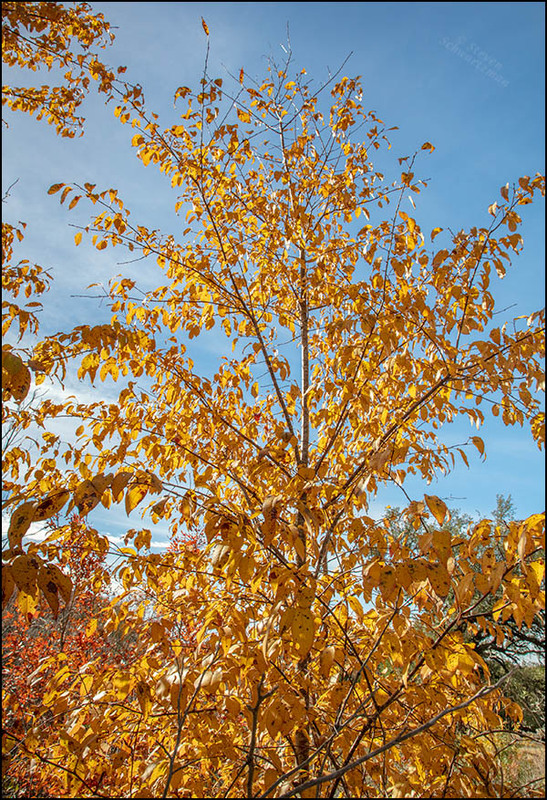 By the stand of black willows visible at the left edge of the first photograph I found a tall, slender stalk with yellowing leaves that Joe Marcus of the Lady Bird Johnson Wildflower Center identified as likely a species of Morus, which is to say mulberry. 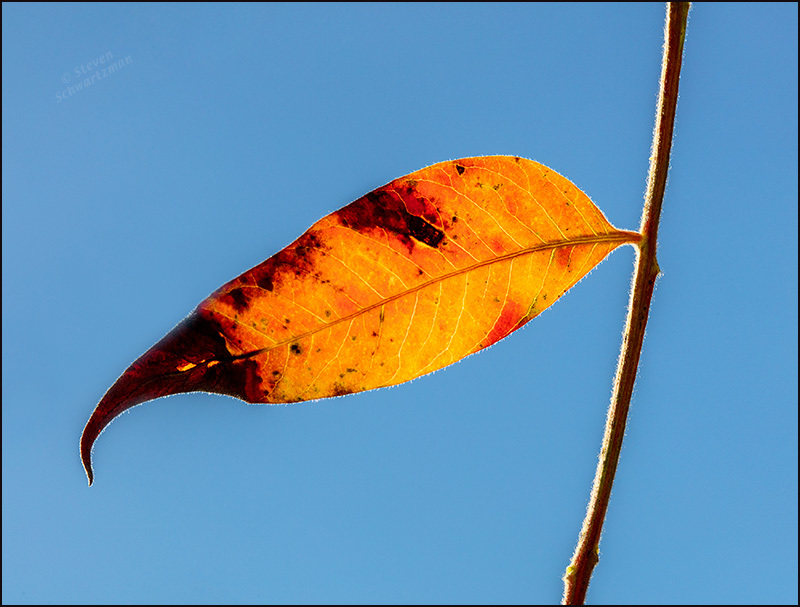 What the vine whose leaves were turning warm colors was, I don’t know, but the combination of yellow and red and orange against the blue sky certainly appealed to me.